All of us here in Áiseanna Tacaíochta (ÁT) would like to remember and pay tribute to Joe T Mooney, a leader of the disability movement in Ireland who very sadly passed away last week. A proud Donegal native, Joe T has made an immeasurable impact in the lives of people with disabilities right across the country, constantly advocating for equal rights and positive change, and offering strong support and leadership to all who came to him. 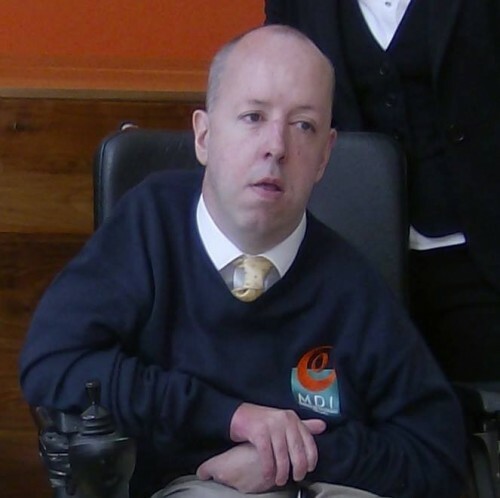 As Chief Executive Officer (CEO) of Muscular Dystrophy Ireland (MDI) over the past fourteen years, Joe T drove progressive, creative and far-reaching initiatives to support people and families living with the condition, as well as the wider disability community. Joe T’s funeral takes place this morning at 11am in the Church of the Sacred Heart, Carndonagh, County Donegal, and he will be buried in the adjoining cemetery. His family have asked for donations to MDI or to the Lucan Disability Action Group, founded by Joe T, in place of flowers. A book of condolences has been opened at the MDI Head Office at 75 Lucan Road, Chapelizod, Dublin 20 for anyone who wishes to pay their own personal tributes, and condolences can also be made online by clicking here. Our thoughts today are with all of Joe T’s family and friends, and with the whole of the MDI and Independent Living community.